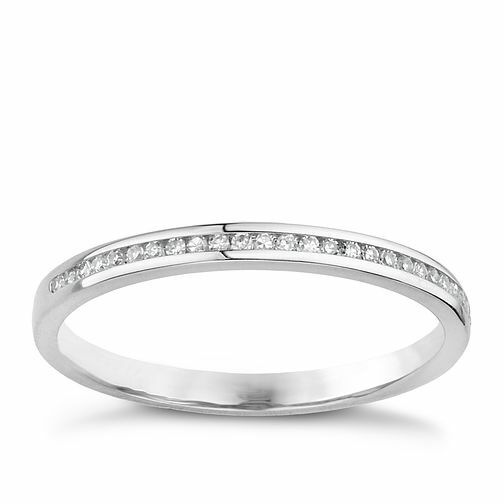 A chic 18ct white gold channel set diamond ring. An elegant gift for an elegant woman. Elegance and style for the woman of your dreams. 18ct white gold diamond channel set diamond ring is rated 3.3 out of 5 by 3. Rated 1 out of 5 by Anonymous from one of the So called diamonds shattered??? Specifica;lly chose this wedding ring as it is a good fit next to my engagement ring...sadly after a few weeks of wearing it one of the small diamonds started going frosty looking, i thought nothing of it until after wearing it for just 2 months that same diamond shattered...there is no damage to the ring itself so seems very strange that a diamond managed to break so easily seeing as diamonds are meant to be forever! very angry and upset and am now seeking a full refund from ernest and jones!